Heveningham, pronounced Hen-ing'm, is, of course, most famous for its Hall, the biggest, grandest stately home in Suffolk. Heveningham Hall was built for the Dutchman Gerard Vanneck in the late 18th century. 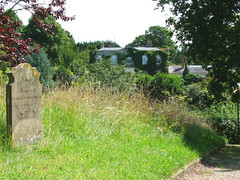 Robert Taylor was the architect, and Capability Brown laid out the Park. Despite falling into disrepair during an inheritance dispute in the 1980s, it looks magnificent from the Huntingfield road, one of England's stateliest and longest Georgian frontages. It is worth noting that Heveningham is not the closest village to the Hall. Huntingfield spreads beneath its frontage, and Cookley and Walpole are also close at hand. This is a land of many small villages, many churches, but few people. 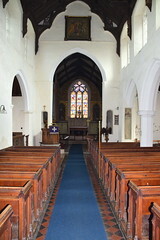 Heveningham church is much older than the Hall. 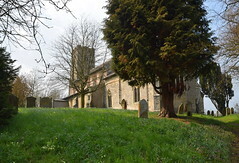 St Margaret sits on a hilltop site close to the old Roman road, two facts that suggest great antiquity. Farms of the estate surround the village. 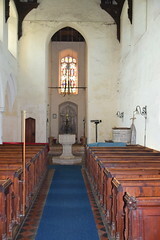 The church of today is largely Perpendicular, the brick clerestory quite late, perhaps 1530s. 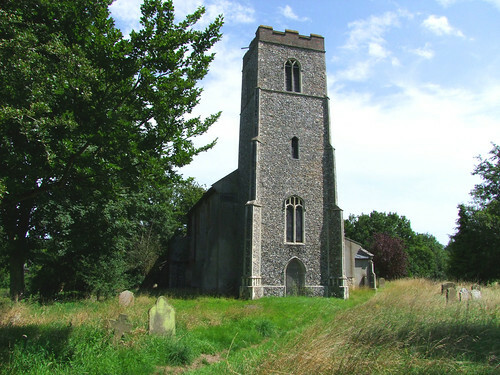 It calls to mind the fine brick tower of the church at neighbouring Ubbeston. 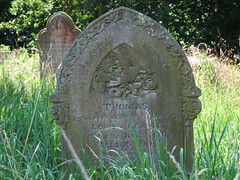 The graveyard is pleasingly wild. But all in all this is rather a serious building, despite the clerestory. 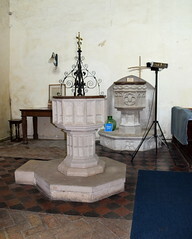 The Victorians were busy here, as we shall see, but your first sight on setting foot inside is of two fonts. 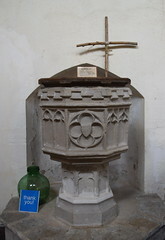 The Victorian one sits in the expected place, but beyond it there is an elegant and rather singular late medieval font which was brought here in the early 1980s from Ubbeston when the church there was sold off by the diocese. The hammerbeam roof above is also late medieval, and a pretty contemporary painted image is set at the east end of the south arcade. Beside it lies the rather grim oaken effigy of a knight, Sir John Heveningham. 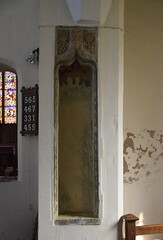 It dates from about 1450, and supposedly once had a partner, his wife. 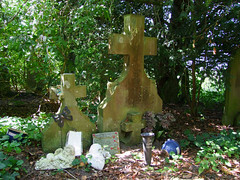 These two effigies were thrown out into the churchyard during the 19th century restoration, and were consigned to a bonfire. 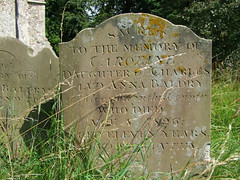 Sir John was rescued, but his wife succumbed to the flames. 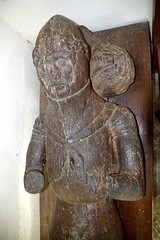 Only one other wooden effigy of this age survives in Suffolk, across the county at Bures. 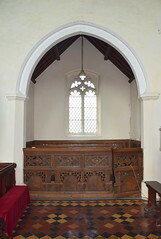 The most notable feature of the nave is the early 19th Century manorial annex pew built for the Huntingfields of Heveningham Hall set on the north side, the reused Jacobean pews still facing the pulpit rather than the altar in the pre-Ecclesiological manner. One pleasing detail if you look inside is that the annex has its own fireplace. 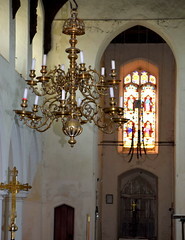 The Huntingfields of those staunchly protestant days would have been appalled by the high Tractarian makeover of the chancel that their descendants paid for. 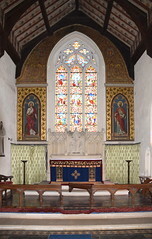 The high reredos is flanked by large paintings of St Margaret and St Edmund. 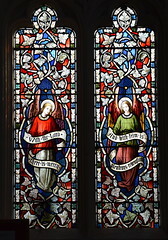 The sanctuary glass, depicting angels on the south side and scenes from the Bible in the east window, is said to be the work of Ann Owen, the wife of the rector of Heveningham in the 1850s and 1860s. Can this really be true? 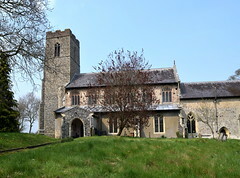 I only ask because this church is less than a mile away from Huntingfield, where the rector's wife, Mildred Holland, more famously redecorated the roofs and ceilings in the 1860s. If it is true, then were these two women colleagues or rivals, one wonders? 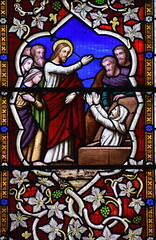 The Heveningham glass does have a charming naivety to its line, but surely the sheer technical feat of the east window suggests a major studio at work rather than an amateur who has no know work anywhere else. I suspect the most likely answer is that Ann Owen had a strong say in what the windows should depict, and may even have provided drawings for the designs, and I wouldn't be at all surprised to learn that they are actually the work of the William Wailes workshop. 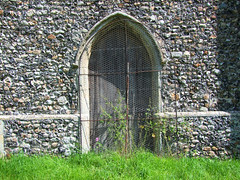 The church leaflet claims that Owens' neighbour and perhaps rival Mildred Holland was also responsible for the painting of the sanctuary here, but this is clearly not the case, for not only is it not in her style, it dates from the late 1890s. But it all makes for a nice story.